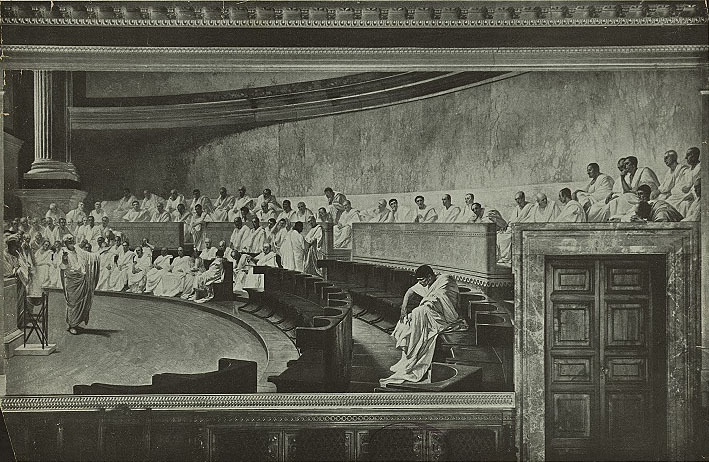 On 2 September 44 BC, Cicero launched into the first of the most blistering oratorical attacks in political history, attacks which ultimately cost him his life. The following is an excerpt of the Second Philippic, a denunciation of Mark Antony, from the Oxford World’s Classic Political Speeches. Do we hear echoes of contemporary political rhetoric in these harsh tones? Conscript fathers, I have something to say in my own defence and much to say against Marcus Antonius. As to the former theme, I ask you to listen to me sympathetically as I defend myself; as to the latter, I shall myself make sure that you pay me close attention while I speak against him. At the same time I beg of you: if you agree that my whole life and particularly my public speaking have always been characterized by moderation and restraint, then please do not think that today, when I give this man the response he has provoked, I have forgotten my true nature. I am not going to treat him as a consul any more than he has treated me as a consular. And whereas he cannot in any sense be regarded as a consul, either in his private life, or in his administration of the state, or in the manner of his appointment, I am beyond any dispute a consular. So to let you appreciate what sort of consul he professes himself to be, he attacked my consulship. Now that consulship, conscript fathers, was mine in name only: in reality it was yours. For what decision did I arrive at, what action did I take, what deed did I do other than by the advice, authority, and vote of this order? And now do you, as a man of wisdom, not merely of eloquence, dare to criticize those proceedings in the very presence of those by whose advice and wisdom they were transacted? But who was ever found to criticize my consulship except you and Publius Clodius? Indeed, Clodius’ fate awaits you, just as it did Gaius Curio, since you have at home the thing which did for both of them. Marcus Antonius does not approve of my consulship. But Publius Servilius approved of it — of the consulars of that time I name him ﬁrst, because his death is the most recent. Quintus Catulus approved of it, a man whose authority will always remain a living force in this country. The two Luculli, Marcus Crassus, Quintus Hortensius, Gaius Curio, Gaius Piso, Manius Glabrio, Manius Lepidus, Lucius Volcacius, and Gaius Figulus approved of it. Decimus Silanus and Lucius Murena, who were then consuls-elect, approved of it. Like the consulars, Marcus Cato approved of it — a man who in taking leave of life showed great foresight, especially in that he never saw you become consul. But Gnaeus Pompeius above all approved of my consulship in that, the moment he saw me on his return from Syria, he embraced me and congratulated me, saying that it was thanks to me that he would once again set eyes on his country. But why do I mention individuals? A packed senate approved my consulship so strongly that there was no one who did not thank me as if I were his parent, and who did not put it down to me that he was still in possession of his life, his property, his children, and his country. But since the many distinguished gentlemen whom I have just named are all now lost to our country, I turn to the living. Out of the body of consulars, two are still with us. The gifted and judicious Lucius Cotta proposed a thanksgiving in the most complimentary terms for those very actions which you criticize, and the consulars I have just named, together with the entire senate, accepted the proposal — an honour which I was the ﬁrst civilian since the foundation of our city to receive. Lucius Caesar, your uncle — what eloquence, what resolution, what authority he showed as he denounced his sister’s husband, your stepfather! He was the man you should have had as your guide and mentor in all your decisions throughout your life — and yet you chose to model yourself on your stepfather rather than your uncle! Although unrelated to him, I as consul accepted Caesar’s guidance — but did you, his sister’s son, ever ask his advice on any public matter at all? Immortal gods, whose advice, then, does he ask? Those fellows, I suppose, whose very birthdays we are made to hear announced. ‘Antonius is not appearing in public today.’ ‘Why ever not?’ ‘He is giving a birthday party at his house outside the city.’ ‘Who for?’ I will name no names: just imagine it’s now for some Phormio or other, now for Gnatho, now for Ballio even. What scandalous disgrace, what intolerable cheek, wickedness, and depravity! Do you have so readily available to you a leading senator, an outstanding citizen, and never consult him on matters of public interest — while all the time consulting people who have nothing of their own, but sponge oﬀ you instead? Your consulship, then, is a blessing, and mine was a curse. Have you so lost your sense of shame, together with your decency, that you dare to say such a thing in the very temple where I used to consult the senate in its days of greatness, when it ruled the world — but where you have now stationed thugs armed with swords? But you even dared (is there anything you would not dare?) to say that in my consulship the Capitoline path was packed with armed slaves. I was, I suppose, preparing violence to force the senate to pass those wicked decrees! You despicable wretch — whether you do not know what happened (since you know nothing of anything good) or whether you do — you who talk with such utter lack of shame before such men as these! When the senate was meeting in this temple, did any Roman equestrian, did any young noble except you, did anyone of any class who recalled that he was a Roman citizen fail to come to the Capitoline path? Did anyone fail to give in his name? And yet there were neither enough clerks nor enough registers to record all the names that were offered. After all, traitors were admitting to the assassination of their homeland, and were compelled by the testimony of their accomplices, by their own handwriting, and by the almost audible sound of the words they had written to confess that they had conspired to set ﬁre to the city, to massacre the citizens, to devastate Italy, and to destroy their country. In such a situation, who would not be roused to defend the national security — particularly at a time when the senate and people of Rome had the sort of leader under whom, if we had a similar leader now, you would have met the same fate that those traitors did? Cicero (106-43 BC) was the greatest orator of the ancient world and a leading politician of the closing era of the Roman republic. Political Speeches presents nine of his speeches that reflect the development, variety, and drama of his political career. Among them are two speeches from his prosecution of Verres, a corrupt and cruel governor of Sicily; four speeches against the conspirator Catiline; and the Second Philippic, the famous denunciation of Mark Antony, which cost Cicero his life. These new translations by D. H. Berry, Senior Lecturer in Classics, University of Leeds, preserve Cicero’s oratorical brilliance and achieve new standards of accuracy. 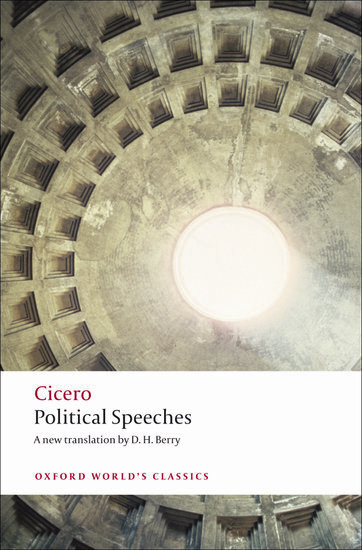 A general introduction outlines Cicero’s public career, and separate introductions explain the political significance of each of the speeches. This edition also provides an up-to-date scholarly bibliography, glossary and two maps. For over 100 years Oxford World’s Classics has made available the broadest spectrum of literature from around the globe. Each affordable volume reflects Oxford’s commitment to scholarship, providing the most accurate text plus a wealth of other valuable features, including expert introductions by leading authorities, voluminous notes to clarify the text, up-to-date bibliographies for further study, and much more. Subscribe to only classics and archaeology articles on the OUPblog via email or RSS.